Each year when teacher appreciation week rolls around I have the urge to sew something cute for my kid's teachers. I never do it. I didn't make them anything for teacher appreciation week this year either. So as the school year came to a close I decided to push myself and make them all zipper pouches. My mom gave me a ton of zippers (probably 30) that she had accumulated and I am determined to use them all. This week I'll be sharing what I made. If you like what you see let me know because when I'm done with my little "show and tell" I'll host a little giveaway. What I give away may be determined by what you all like best. Here are the first set of pouches, made for the preschool teachers. 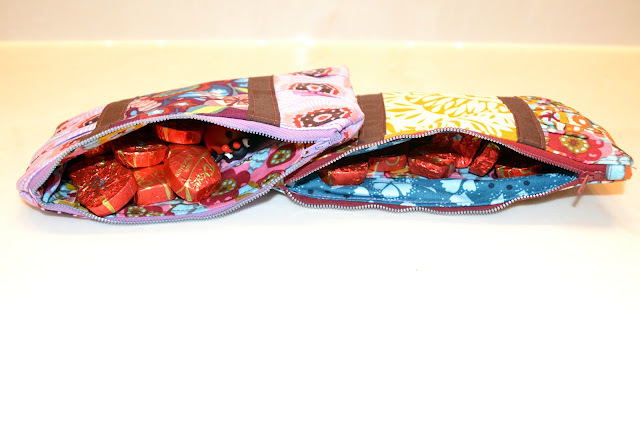 I love them the best and I wanted to give them something I would want, so I made them little gathered clutches in my current favorite fabrics. This is the Gathered Clutch with a Twist in Innocent Crush fabric by Anna Maria Horner. I stuffed them with chocolates and a little ladybug finger puppet that Jack picked out for them. Can you see it peeking out of the one on the left? His class was the ladybug class. You should try making one of these. I promise you'll be happy with the results. More to show coming tomorrow... until then, Happy sewing! SO cute! These seriously are so darling Sarah! Really cute! My mom was a teacher... It seems to me the end of year gifts have gotten way way cuter! They are super adorable, and as I always tell you I LOVE how you combine your fabrics! Both are gorgeous. I love the Innocent Crush line of fabric!! These are so cute! I love the one with the mustard yellow flower print in the middle. Awesome!